Even better, the interviews in this book contain 70% never-before-seen material…and the 30% that was seen was published in UK-based magazines back in 1999. * 30 never before seen photos and drawings. * A complete story description of an unknown episode called “The Walls of Hell.” The would-be writer of this episode, Larry DiTillio, details point-by-point would have happened. * Who the medieval and modern literary characters were that J. Michael Straczynski had in mind when he created Galen. * Why the White House had to intervene when Peter Woodward was cast as Galen. * The one reason JMS rejected virtually all the women that auditioned to play Dureena Nafeel. * Specifics about how the Excalibur set was designed to facilitate filming and how that affected the look and feel of the show. * Why the character of Lt. Matheson was not defined as man, women, young, old, or by ethnicity when the show was cast. * JMS’ thinking when he made Matthew Gideon a gambler, a renegade and secretive character. * Why TNT demanded certain sets and costumes be changed during the first hiatus. * Why Captain Gideon was gunned down in the unfilmed season finale. * Why Dureena’s contact lenses were made less scary between the filming of “A Call to Arms” and the start of Crusade. * The reason Trace Miller (the shuttle pilot) appeared in only two episodes when it was expected that he would be a series regular. * Dr. Sarah Chambers’s original name when the show was first conceived. * Why Edward Woodward, father of Peter Woodward, was cast as Alwyn. * Peter Woodward’s other behind the scenes vocations and how they related to his acting. * Details about how the actors really felt about working with directors Mike Vejar and Janet Greek. * How J. Michael Straczynski prepared the Crusade actors for the type of stardom that comes with being in a popular science fiction series. * The ways in which many of the cast members found out about the production shut down and Crusade’s cancellation…and their reactions. * Why the Crusade producers had to fly to Chicago to interview a particular actor before they could offer the role. * Which Crusade character would have been possessed by the Apocalypse Box if the series had continued. * Gary Cole’s thoughts on how Captain Gideon measures up to other characters he’s played, like Mike Brady in the Brady Bunch Movies. * The histories some of the actors made up to help them get to know their characters. * The specific inspiration for the black uniforms that replaced the gray ones. * How the cast of Crusade first met and what happened at that meeting. * What aspect of Crusade made J. Michael Straczynski happiest (and what didn’t). * Which cast members were familiar with Babylon 5 and which were not. * What back story JMS give his cast to help them develop their characters. * How JMS “erased the line” between the actors and their characters. * How long JMS originally intended to keep viewers in the dark about the true nature of the Apocalypse Box. * What iconic TV personality’s voice does JMS liken to Daniel Dae Kim’s. * How production designer John Iacovelli planned to realize alien worlds on indoor sets and how he would have differentiated the look of various planets from one another. * What specifics the famed Jet Propulsion Lab contributed to the alien-specific aspects of Crusade. * Why “War Zone” replaced “Racing the Night” as the premiere episode. * Why Crusade premiered in June when most television shows debut in September or January. * How the directors and producers on the show describe the differences between Gary Cole and Bruce Boxleitner as a leading men. * Carrie Dobro’s candid feelings about her less-than-glamorous role as the resident tunnel rat. 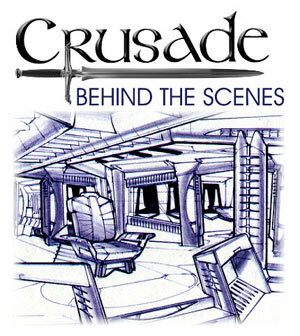 * How directing Crusade differed from directing Star Trek, according to two of Crusade’s directors. * Richard Biggs’s candid thoughts about playing Dr. Franklin on Crusade, without the familiar trappings of Babylon 5. * How the cast and crew felt about the unusual situation of an entire season of the show being produced before the first episode ever aired. * Why composer Evan H. Chen never listened to Christopher Franke’s score from Babylon 5. * How actor Tim Choate landed the role of Polix and how he differentiated it from his Babylon 5 character, Zathras. * The disappointment of the original Drakh makeup. * Details of Peter Woodward’s relationship with actress Judi Dench. * Why Peter Woodward would get beaten-up on film sets when not acting. * How Gary Cole built his character from a forty-five-page script. * The starting point design-wise for the Excalibur uniforms. * Why Eilerson in is civilian clothes instead of a uniform. * How the Babylon 5 props were redesigned because Crusade was five years further into the future. * Whose idea it was to put the camera dolly tracks in the ceiling. * The secret’s out — find out what the actors tended to do with their uniform costume pockets. Editor’s notes are included throughout the book. These notes describe what is happening in the Crusade production time line at the point of each interview. This way each question and response has context.